Welcome to the site guide for Planetary Tantra, a complete and autonomous site nested within metahistory.org. The above banner with aboriginal art identifies pages in PT. The menu-tree in the left margin presents the categories or genres of PT to be introduced and described below. Site Guide takes you to the corresponding tour for metahistory.org, the mother site. Tantra Tour takes you to this page. A click on the green logo (Tree and Well) in the upper left takes you to the home page of the mother site. That leaves six buttons for the six categories of PT. The Kali Face takes you to another URL presenting elements of Kala Tantra that lie beyond the parameters of Planetary Tantra — "transgressive" and taboo material. Some essays in Foundations (below) position Kala Tantra within the frame of Planetary Tantra, but kalirising.org presents a full and flagrant disclosure of the principles and rites of liberation through desire, the spiritual option unique to the end of Kali Yuga. This category of PT comprises one text, originally posted on January 26, 2009. The Vow is the tool of access and participation in Planetary Tantra. With it come three instructions in the language of the Diamond Sky Dakinis. Doing the Vow is all it takes to begin exploring interactive magic with Gaia. It is the gateway to Planetary Tantra, open to all. 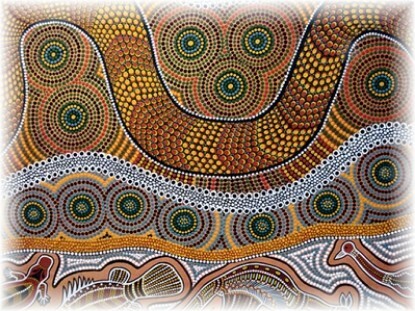 This is the page accessed the PT banner with Aboriginal art at the head of all pages in this section of the site. The portal page defines PT as "Shaktism reinvented," a ritual of power-sharing with the Goddess, the living earth. It considers the task of "delivery," how to get the message of PT out to the world, explains the conversion from a Gnostic to a Tantric idiom, and places the subject in a Gaian framework. Along with a glimpse of dakini wisdom, and intimations of the outrageous freedom of this practice, it includes my personal disclaimer as inceptor of the practice. With mamallian birth there is an afterbirth, the placental sac in which the newborn has been gestating. All this Gnostic-Tantric rigamorole and esoteric Tibetan-Sanskrit jargon is the placental matter of the birth of a new psychic constellation in the human species. The psychic constellation that now emerges into a visionary event has been gestating in material that belongs to the religious imagination of our species. This religious material adheres to the constellation like the placenta to the newborn. But once birth has occurred, the midwife has to carefully count the parts of the afterbirth, of which there are 28. She does this to make sure the placenta is entirely discharged and no section remains in the mother's body where it can cause lethal infection. In these essays you could say that I am counting the parts of the afterbirth. 1 Gaia Awakening: Invitation to Planetary Tantra announces that "Gaia, the living earth, is having a lucid dream. She is not awakening from sleep, she is waking in her sleep." This essay sets out the key points of orientation to PT, including its historical origins in the oral-only teaching given by the Buddha Shakyamuni, contrary to the teachings he gave to the word at large. It includes my apologia as the first self-identified participant in PT, and my place in the nine generations of Kali Yuga, 3102 BCE - 2215 CE. 2 The Tantric Conversion I: From Sophia to the Shakti Cluster describes the challange I faced upon the publication of my book, Not in His Image in November 2006: namely, how to advance and enhance the Sophianic vision of the Mysteries, going beyond the Gnostic materials. This I do by converting the Greek SOPHIA into the Sanskrit VIDYA: both words mean wisdom. Due to the impoverished language of the Coptic sources, it is impossible to bring the fantastic sophistication of Gnosticism into modern expression. But this conversion allows me to draw upon Hindu and Tibetan teachings on the nature of consciousness, power, and magic, effectively reformulating the ancient science of gnosis in vivid and accessible terms. The Sanskrit equivalents to gnosis are prajna and jnana: the root JNA is the Asian counterpart to GNO. It is the same wisdom, East and West, hence, Planetary Tantra. 4 Orientation to Planetary Tantra: Q and A is an incomplete text that covers some aspects of PT, such as hedonism, and the requirements for practice. It also compares PT to traditional yoga. I propose that PT be considered as the yoga of discovery. 5 Dakinis on the Roof: Misconceptions About Planetary Tantra addresses the possible view that PT is "black magic," or some form of "Satanism," whatever that is. It considers the nature of divine wrath in its feminine expression and compares PT to "diety yoga" in Tibetan Tantra. There is a digression on clairaudience to explain subliminal reception to the frequencies broadcast on the organ-like console of the Shakti Cluster. It concludes with a key principle of Kalika goddess worship: "The religious practices of the devotees of Adya Kali are a pleasure to perform" (Mahanirvana Tantra). 6 The Future of Rapture 1: Objections and Resistence to Planetary Tantra. Here I address the question of my delivery of the wisdom treasure (terma) I have discovered. I respond to some objections to the perceived religiosity of my presentation, and counter those concerns with a challenge: How would you realize the utter transparency of your narcissism as a test of spiritual awakening? This essay is rather volatile as it reflects my struggle with what appears to be grandiosity, and consequent flaws in my delivery. It concludes with an important claim: PT is not the only message of planetary shift unfolding right now, but it contains the "integral lode" of transformative potencies inherent to the awakening of the planet itself. 7 The Future of Rapture II: Planetary Tantra and Religious Dementia lists 13 factors of PT that highlight its original and radical nature. It refutes the idea of a reward system in human morality and suggests that loving the earth is not a means to an end but an end in itself. I argue that those who dedicate themselves to the Divine Feminine in the guides of Gaia and Kali are not like the "saved" of Christian religion, or the "chosen ones" of Judaism. It concludes with some reflections on the relation of Planetary Tantra to Kala Tantra. For more orientation material, see terma: What is the Terma of Gaia Awakening? and The Terma of Gaia Awakening in Practice. 8 How to Practice Planetary Tantra: Basic Interactive Magic with Gaia. This long essay sets out the framework for practices in Plnaetary Tantra, using the Buddhist legend of King Indrabhuti who was given secret Tantric instructions by the historical Buddha, Shakyamuni. It explains the nature of dakini wisdom as sublime memory of enlightenment in the body and stresses the role of consort yoga on the path of Gaian Tantra. It concludes with the key disclosure (or claim), namely, the Shakti Cluster is a turbulent vortex in the atmosphere of the earth, and it cites scientific evidence of the existence of such a vortex. 9 Dakini Weather: Longchenpa's Scenario with the Herukas opens with references to some books by women Buddhist scholars that I have found useful in the Tantric conversion of Sophianic teachings. This is a long and complex essay on visionary experience with dakinis seen in the sky, as described by a Tibetan tantric master of the 13th Century CE, Longchenpa. It outlines the "correction event" hinted in Gnostic writings on the divine Sophia, the goddess who morphed into the eeart. 10 Heart Drop Medicine: The Shakti Cluster as a Vortex of Gaian Correction The title is an illusion to my mystical realization at the Ronda Moment. This essay describes how I develop the correlation between Gnostic and Buddhist Tantric teachings: for instance, converting the Buddhist trikaya into the language of Gaian Tantra. It concludes with esoteric details about the eighteen-petalled lotus in the upper chest, and the pentagram at the center of the Shakti Cluster. The Diamond Sky Dakinis hold you to your highest desire, your supreme personal desire, and do not dissociate it from the quest for liberation, but make it the paramount condition for that quest. It explains the scholarly terms desideristic and liberationist and how both of these factors merge in the Shakti Cluster, and complement each other. It concludes with a quote from the Mahanirvana Tantra (11 Century CE), a rare written text containing some indications of the oral-only transmission of Kala Tantra, the spirituality uniquely fitted to the close of Kali Yuga. 12 Toward the Secret Gathering: Freedom and Desire in the Shakti Cluster This essay lists the components of the Shakti Cluster, the 10 Mahavidyas of Hindu religion, and the 6 Diamond Sky Dakinis of the central pentagram, and two more frequencies. This category represents my attempt to show that Planetary Tantra is the outgrowth and application of a "wisdom treasure" that I received in August 2010. For the most part, the titles explain what you will find in the texts. What is the Terma of Gaia Awakening? This is a single entry: a poem from the Yeats Conversions, II, Tantra Outbound.